Paul Bates was nervous. The feeling surprised him a bit. A successful entrepreneur, Bay Street investment broker and storied CEO, he’d sat in his share of executive boardrooms. He’d lectured auditoriums filled with some of the smartest, toughest, most egotistical business minds in the country. Yet here he was, in a modest boardroom at McMaster University, his hands shaking. This profile by former Spectator reporter Naomi Powell was published about 20 months after Bay Street veteran Paul Bates was named Dean of McMaster University’s DeGroote School of Business in March, 2004. 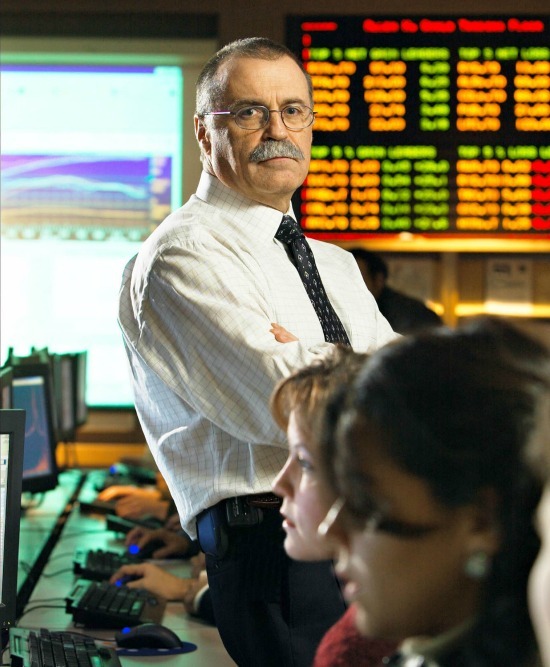 The photo shows Bates with students at the school’s Allen H. Gould Trading Floor. It was February 2004 and Bates was sitting his first job interview in 20 years, for a position he never imagined he’d fill: dean of the DeGroote School of Business. On the other side of the table, sitting quietly amid the panel of professors and administrative leaders, Dr. Milena Head considered the fit, charismatic man in the three-piece suit. Of the six candidates in the running for the dean’s job, Bates was most certainly the underdog. She noted the shaking hands, the occasional quiver in his voice. For the first time in the school’s history, the dean’s search committee had decided to look outside traditional academic circles to consider candidates from the business world. Bates was the ultimate business leader — a 55-year-old Bay Street powerhouse and pioneer of discount brokerages — but the only candidate on the short list without a university degree. For Bates, the job was a 75 per cent pay cut. It meant leaving the familiar world of Bay Street for the unfamiliar land of academia. It meant buying a farm in Flamborough where he’ll settle with his wife, Sally, in the spring. But in some ways, it also meant coming full circle. At 19, living in East London, England, Bates planned to go to teacher’s college — a idea scuttled when he and his now-wife Sally learned they were expecting a child. “I figured we’d be getting married pretty soon, so I went down to the employment office to look for any job I could find, ” Bates says. The only job available was not in a business suit, but blue serge uniform of a traffic constable. Every morning, Bates directed traffic on Tregenna Hill, outside the National Westminster Bank. He got to know bank regulars, including its manager — a tall, stern man named Stuart Guppy. One day, “Mr. Guppy, ” offered Bates a teller’s job. For the next two years, Bates was a banker by day and moonlighted as a taxi driver at night. He climbed the ranks to become the second-in-command and by 1973, the average age of his peer group was 10 years older than he was. “I realized that although I’d risen fairly quickly, my career was going to plateau for a while. He opted to take a job at Scotia Bank in Nova Scotia, where again he shot through the ranks. He eventually moved to Toronto, where at 36 he became Royal Trust’s head of investment and wealth management. By then, Bates was used to being the young pup on the executive floor, so when First Marathon Securities approached him to become president of their fledgling discount brokerage firm, he jumped at the chance. There was big money to be made. Although brokers’ fees had been determined by the market for decades, deregulation meant for the first time brokers could set their own fees according to the services they provided. Investors who wanted to do their own research and choose their own stocks, could choose a discount broker to make the trade. Bates took the helm of Marathon’s discount startup, eventually growing it to become the second largest brokerage of its kind in Canada. The largest firm, TD Greenlight, picked up Marathon and in a rare move asked Bates to take over as president of the new corporation. A year later, he started his own discount firm, Priority Brokerage, and set up shop on Toronto’s Yonge Street. He worked round the clock to build the company and maintain the volunteer work that had become a significant part of his life moving to Toronto. While still a private firm, Priority was snapped up by Charles Schwab and Bates once again found himself heading up a new corporation, this time as CEO of Charles Schwab Canada. He moved into a spacious office on Toronto’s Queen’s Quay with a view of Lake Ontario and decided to settle down for a while. “Then came Sept. 11 and that changed everything, ” he says. The investment business suffered and Charles Schwab decided to close its international offices. This time around, Bates decided to build a “portfolio of jobs” that would allow him to split his time between directors’ posts on various corporate boards, teaching at the University of Toronto’s Rotman School of Business, his volunteer work and his family. Always interested in the issue of business ethics, he volunteered at the Ontario Securities Commission, and launched into a project examining the relationship between broker and investor. The project led to new regulations designed to protect investors. It’s Bates’ passion for ethics that is largely driving his vision for DeGroote’s future. He is now a commissioner at the Ontario Securities Commision and is attempting to reset the compass at DeGroote, identifying ethics, leadership and innovation as the three pillars for his overall strategy. He has hired a consultant to review how the school incorporates ethics into its courses and makes a point of providing real-world examples to his students. But his lack of academic experience hasn’t been lost on everyone. As a way of addressing the gap, Head was named associate dean academic for the school. But there are some in the department who still worry that having a non-academic at the helm will mean less emphasis on research. He focuses his energy on building consensus among faculty — a new skill for a manager used to directing staff — and remoulding the relationship between dean and student. Each month he hosts “Dean on Deck, ” where he stands before students to answer their questions. And he tries to make appearances in as many classes as possible, often to drive home the importance of ethics. After a year at DeGroote, he is still contacted by search firms anxious to draw him back to Bay Street. But he has no intention of leaving. DeGroote has never had a dean stay for more than one term. He wants to be the first.